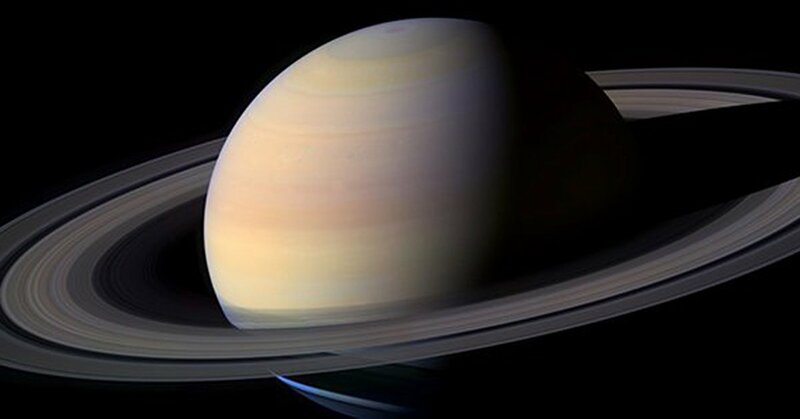 A recent news story reported on the latest measurement of Saturn’s rotation rate–10h 33m 38s, plus or minus a minute or two.1 This is significantly shorter than what is found in most astronomy textbooks. You may think: How could it be difficult to measure a planet’s rotation rate? All you have to do is look for features on a planet’s surface and time how long it takes for them to go around. That is the sort of technique used to measure the rotation rate of a planet with a visible solid surface, such as Mars. But many of the planets don’t have a visible solid surface. For instance, Venus is perpetually surrounded by thick clouds that block our view of its surface. However, radar can easily penetrate those clouds to bounce off Venus’s solid surface, so we’ve known the rotation rate of Venus for a half century. But Saturn, like the other three Jovian, or gas giant, planets are even more difficult. The Jovian planets (Jupiter, Saturn, Uranus, and Neptune) are made primarily of hydrogen. Hydrogen is typically a gas, so the Jovian planets have extensive atmospheres made mostly of hydrogen. These atmospheres are a couple hundred kilometers thick, below which the extremely high pressure gradually transitions the hydrogen into liquid. Therefore, most of the bulk of the Jovian planets is made of liquid hydrogen. Near their centers, the Jovian planets almost certainly have cores made of rock surrounded by various types of ice. All we see of the Jovian planets, including Saturn, is the tops of their atmospheres. All we see of the Jovian planets, including Saturn, is the tops of their atmospheres. But their atmospheres are marked by many spots of various sizes and colors. So, astronomers easily can measure the rate at which these spots spin around the planet, yielding the rotation rate. Except that the measured rotation rate depends on the latitude. It takes 10h 14m for spots on Saturn’s equator to rotate and 10h 38m to rotate at Saturn’s high latitudes. How can this be? There are winds at high altitude that move the clouds at different rates at different latitudes. Such differential rotation is common in planetary atmospheres. Even on the earth, the high-altitude winds are different at different latitudes. And the sun, which is gaseous throughout, exhibits differential rotation. Will the Real Rotation Rate Turn Up? Still, there must be some rotation rate that the bulk of the planet has. Saturn has a strong magnetic field that probably is generated deep in its interior, just like the earth’s magnetic field is. As Saturn rotates, its magnetic field rotates with it. Therefore, instruments aboard the Voyager spacecraft almost four decades ago measured the rate of rotation of this field during their flyby missions (1980–1981). The Voyager probe data yielded a rotation rate for the deep interior of Saturn of 10h 39m 24s. This remained the definitive rotation period of Saturn for more than two decades. But then came the Cassini spacecraft that orbited Saturn for several years. Similar measurements resulted in a rotation rate of 10h 46m, about six minutes longer. This made no sense, for no one believes that the rotation rate of Saturn could change so fast. Hence, the necessity to take a new approach in measuring the rotation rate of Saturn. The recent study examined waves in the C Ring, a faint inner ring of Saturn. The data came from many very detailed images of the C Ring taken over several years by the Cassini probe (2004–2017). The waves are believed to be stirred up by seismic activity deep inside Saturn. It is a complicated mechanism that stirs up the waves. Furthermore, the waves are sensitive to Saturn’s rotation rate. The new study modeled the physics involved in producing the observed waves in the C Ring to derive the rotation rate. Perhaps the dissimilar rotation rates of Saturn are evidence of Saturn’s extreme youth. So, which rotation rate of Saturn is correct? Probably none of them. I’m most leery of the latest one because it appears to be the most model-dependent of the lot. At least the others seem to be rather straightforward. For such a fluid body as Saturn, “the rotation rate” ought to be some sort of average of the rate of spin for the entire planet, but how does one measure that? The spin of the magnetic field probably comes closest to that. But how can one explain the dramatic change in that rotation rate in a little more than 20–30 years? It probably indicates some very dynamic changes taking place deep inside of Saturn, with perhaps the core spinning at a different rate than the rest of the planet. For instance, suppose that Saturn’s core were spinning faster than much of the rest of the planet: frictional losses would slow the core’s spin while speeding up the rotation rate of layers above. But this cannot go on forever, for frictional losses eventually will result in a nearly single rotation rate. How long would this take? That isn’t known, but it certainly would take far less than the supposed billions-of-years age of Saturn. Perhaps the dissimilar rotation rates of Saturn are evidence of Saturn’s extreme youth.